It's our last day at Budleigh Farm and I'm determined to get out and about - whatever the weather. Looking out of the window that resolution seems a tad foolhardy. Even after the first few paces one thing is clear: it will be a challenging day ahead. 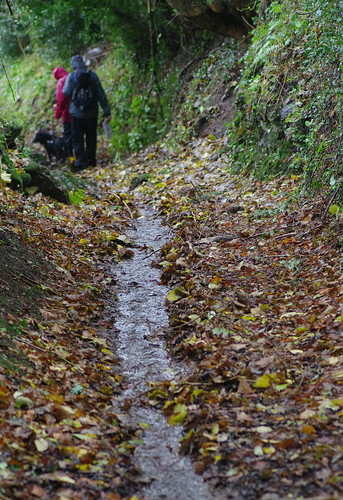 The footpath up the hill is fast becoming a sodden mire, its central channel is now a watercourse. Logic suggests an about-turn but is overruled. From determination (or is it stubbornness?) we plough on regardless. There certainly aren't many photo opportunities in these conditions. I concentrate on following the map and the faded yellow circles and blobs of paint on wooden posts and tree trunks. I don't want to add insult to injury by getting us lost. I'm inclined to think this might be Usnea cornuta. 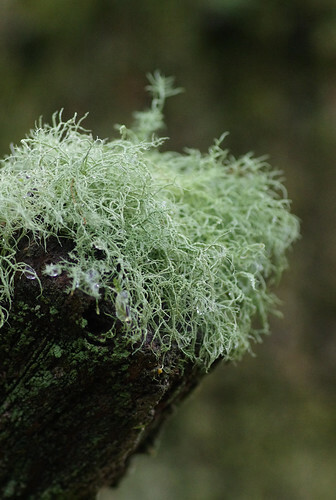 But the differences exhibited between some of these Usnea species almost appear non-existent to the naked eye. 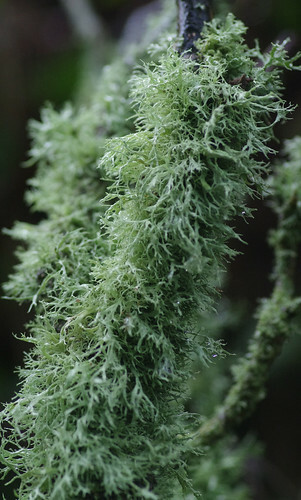 The branches are commonly round and can be constricted (as in the appropriately named String of Sausages lichen [Usnea articulata]) or unconstricted. Some species can also be blackened at the base of their main stems. Not knowing this at the time, I neglected to look. Our ascent up the hill was a bit technical as we had to change direction many times. At the top we turned left along the road and headed for Cossick Cross. 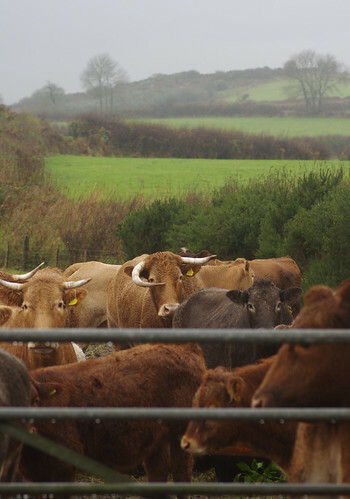 The cattle in the background are British Limousins, reputedly the most popular beef breed in the U.K. We passed them from afar along a previous section of path, watching them munch their way through fodder. This carpet of moss was in the hedge. I was surprised how soft it felt when I swept my hand across. 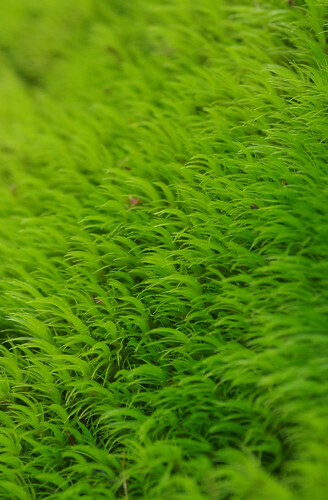 It was grassy and feathery. If it was on the ground you could probably use it as a pillow and drift off in no time. On a fair day, that is. By this juncture our waterproof jackets were as waterproof as sponges. 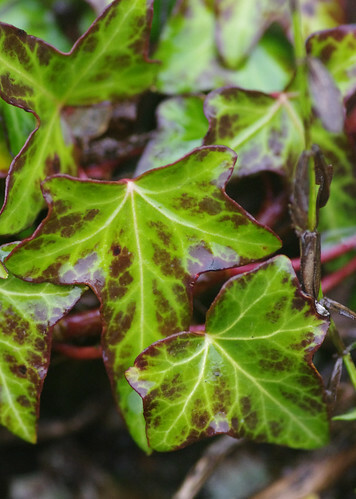 This is a different colour form from the ivy leaves we are used to seeing. Perhaps they were originally a cultivated variety, though I'm not sure how they ended up in a Dartmoor hedge. The nearest house must have been at least half a mile away. At Cossick Cross we went straight ahead for Doccombe Cross, then left until joining the main road for a minute or so. 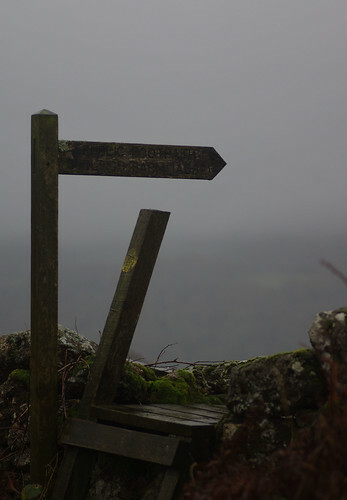 The sensible thing would have been to carry on and walk straight for Moretonhampstead. But I preferred trying the cross-country route - even if it ended in failure and meant we had to turn back. I noticed on the map that we would have to cross a stream and kept my fingers crossed. Is this a Mosaic Puffball? The pattern towards the top suggests it might be. 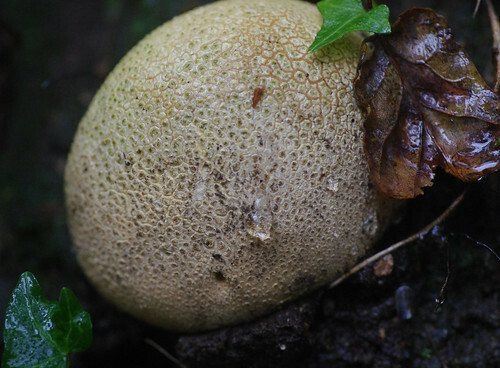 But puffballs usually have crusty ridges a bit more pronounced than in the specimen above. It was lying nestled in a soil bank on our left. Yet again it seems that what we see does not quite marry up with the photographs in the field guide. Or perhaps I am magnifying the differences too much and should be allowing more leeway when looking at the closest match? Then we turned again, heading in a roughly westward direction. Among the leaf litter and fallen branches, my hopes we would find something were duly rewarded. This is a common species and we've occasionally encountered it before on woodland wanderings. While this piece of entangled tinsel doubling as a lichen had me in knots. The branches are flat and strap-like, suggesting a member of the Ramalinas. Some paths draw you in physically and mentally. 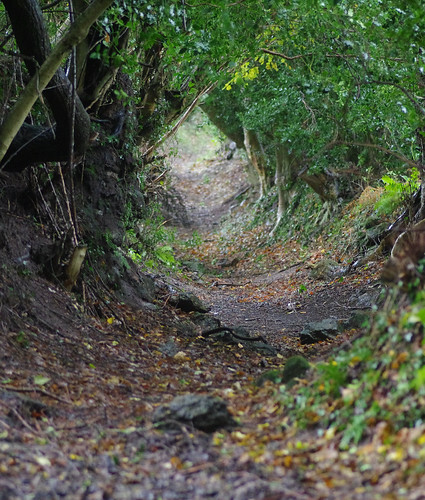 The overhanging trees met in the middle and formed a protective canopy. Though Lady does not look very impressed. And rest assured, the person taking the picture was just as soaked. 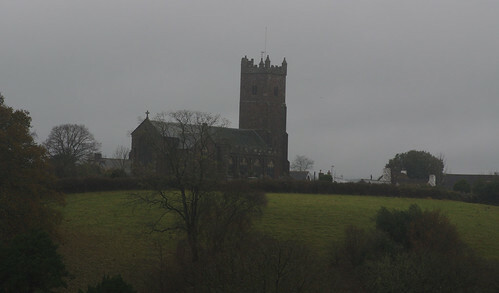 Thankfully, we were on the last leg: on our way into Moretonhampstead and the road back to Budleigh Farm. The rain was still torrenting and bucketing every which way. Many years ago I read something in a camping survival book which regularly comes back to haunt me on days such as this. The author did not mince words and laid everything on the line with a simple equation: Wet + cold = dead. But before rigor mortis set in, there was one last thing to record for posterity. 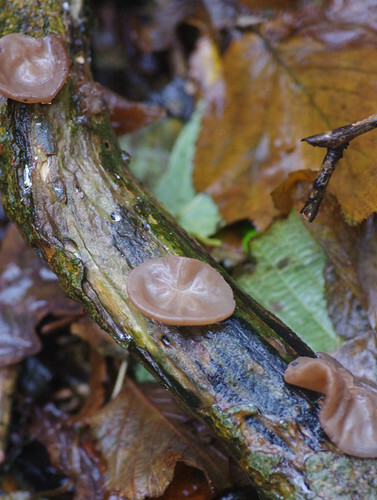 These don't look anything like the brownish (with a hint of burgundy) Jelly Tooths in my Fungi field guide. 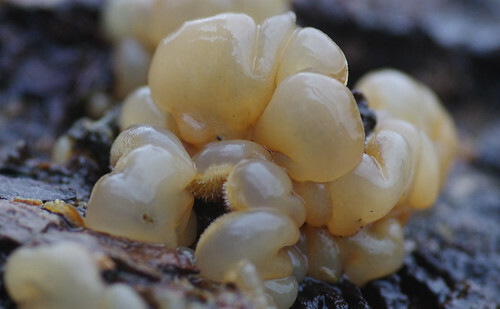 But they are clearly gelatinous and possess the same whitish spines underneath. Perhaps this is how they appear before maturing. I'm amazed Sherry managed to keep a steady hand and obtain a blur-free shot. I should also mention that the camera coped with the elements admirably. We may bemoan its lack of auto-focus speed from time to time but there's no disputing that the Pentax K5 is one rugged beast. It soldiers on when other models might have packed up for good. I thought I might be the only one mad enough to venture out on such a ghastly day. 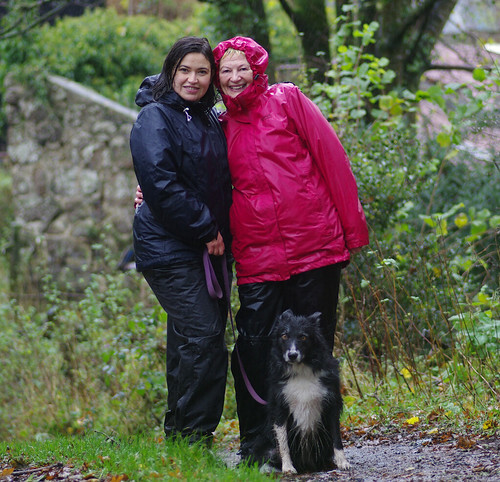 Many thanks to Sherry and Jane for being such good sports and agreeing to brave the elements with me.